A few months ago, a coworker of mine got married. A few months before that, she got engaged. On the morning she rolled in with one finger buckling under the weight of a god-knows-how-many-carat diamond, our six-person team huddled in a secluded office for a private, giddy, workday champagne toast. The weeks that followed were filled with glossy venue brochures, phone calls to florists, and dresses. The venue she eventually chose was in Manhattan, at a place I’d only ever seen on TV, populated by celebrities. Like many Manhattan interiors, its most extraordinary feature was on the other side of its windows. The ceremony was beautiful, officiated by the bride’s brother. It rained that evening, but only slightly, leaving the verdant rooftop garden (*swoon*) quite usable. 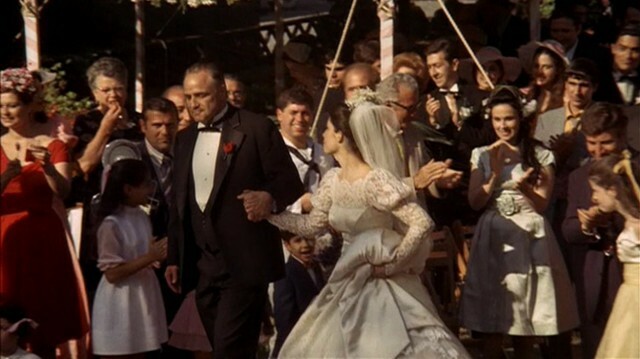 It was the first wedding I’d attended as a grown person; the only other one I’d been to was my aunt’s, an evening ceremony where, as an eight-year-old ring-bearer, I kept dozing off and dropping the ring. 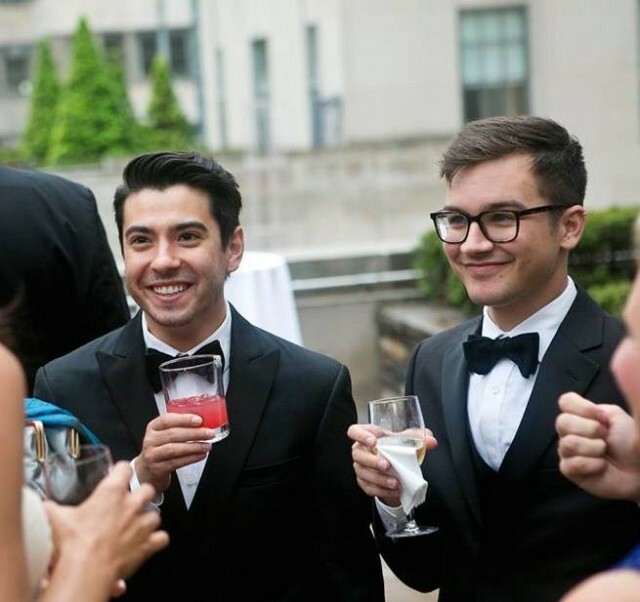 It was also my first black tie wedding — and likely my last, knowing my friends. I knew I needed to rent a tuxedo, but put it off until the week before, as I do with most things that involve a social obligation to spend money. I went to the chain tuxedo rental store near me to get fitted, and picked out a slim-fit shawl collar black tuxedo — also known as the cheapest one. It came with a clip-on bow tie, vest, socks, cufflinks, and a white shirt with sleeves I discovered were not made for cufflinks. The total for my rental was less than I’d expected to pay, and only slightly more than I had hoped to pay: $172.01. Two days later, the bride texted me to ask whether my boyfriend wanted to come, too. Initially I couldn’t have a plus-one for space reasons, but someone’s nth cousin had flaked, so there was an unexpected opening. He was game, especially since I offered to cover his rental (my friend’s wedding, my expenses, I figured). He went to the same local chain tuxedo rental store and, despite instantly making friends with every person there, managed to pick out a tuxedo almost one-and-a-half times as expensive as mine, for $237.34. He felt bad about the price, so he insisted on chipping in $100, bringing my out-of-pocket down to $137.34. Including my rental, the total came to $309.35. A few days later, in the afternoon on the day before the wedding, I returned to the store to try on my rental. I took the heavy garment bag into a dressing room, and my disappointment swelled. Each successive item seemed to fit worse than the previous one, from shirt to pants to jacket, which was nearly the right size, but felt somehow as though it hadn’t started off that way. The pants were enormous, fitted in the waist but with wide rectangles for legs. With the slim-fit jacket, I looked like Charlie Chaplin. There must have been a mistake, I told the saleswoman, describing the situation with the pants. She explained that for slim-fit rentals, only the jacket is slim-fit. “Huh,” I said, confounded as to why anyone would want or need a tiny jacket in combination with huge woollen balloon legs, bunched up on patent-leather square-toed shoes. There was no way I could wear this in public, much less to a wedding, much less to a wedding of someone I knew. I panicked, and canceled the rental. I’d figure something else out — H&M had slim black pants, maybe I could fool people. There was a $20 cancellation fee, which I ate without protest, making my return -$152.01. (Total out-of-pocket now $157.34.) Certainly I could find some makeshift, next-day-returnable pseudo-tuxedo for that, no? My boyfriend’s tux would be a wash, but I was still out less than I’d expected to pay at the start. And so began a full afternoon of scurrying from H&M to H&M to T.J. Maxx, color-matching black fabrics and price-checking white dress shirts. The shirt I eventually found cost $27.98 — way more than I’d hoped to spend, but obviously the price range of hope is $0 to $10. After that, I spent $50.85 on a vest and two bow ties at H&M — even the desperate want options — all of which I planned to return. Ultimately I only returned one of the bowties, making my net H&M spending $37.90, and, with the shirt, bringing my total out-of-pocket up to $223.22. I was up to $65.88 for accessories alone, with not a jacket nor a pair of pants in sight. I met up with my boyfriend back at the chain tuxedo rental store, where he was being fitted. Somehow, for $237.34, he ended up in quite a smart suit. He didn’t look anything like Charlie Chaplin, but instead like a shorter, swarthier James Bond. It was it this point that I wandered over to the chain tuxedo rental store’s for-sale section, which I had told myself I Would Not Do. I started poking gingerly through the racks until, as often happens, a man in pointy leather shoes came over to offer a brain-scrambling hard sell. Twenty minutes later, I was standing in a tuxedo and liking how it looked. It was $240, but with the aid of a coupon I’d received after my initial rental (ha ha! ), I walked away with it for $195.96. All told, this was $261.84 for my outfit for one night — $274.79 at the time, since I’d yet to return the second bowtie. My boyfriend’s exorbitant $237.34 getup turned out to be a bargain. By the time we set foot onto the verdant if rainy rooftop garden, I had spent $432.73, including the unreturned tie. We ate and drank, and at an afterparty I spent $22 on two beers, because Midtown Manhattan. We followed the crowd to a club somewhere downtown, where we spent no money, but drank many more drinks. An extremely intoxicated cab ride back to Brooklyn was $15 or so, bringing the grand total of the occasion — two tuxedos and tuxedo trimmings, overpriced drinks, and a ride home — to just over $460, or, almost half my rent for one month. And we still have to send a gift. John is on the right, and Ashton is on the left. John Sherman is a writer and copy editor and sometime bookseller in Brooklyn.